There are many Twitter widgets available that allow you to show tweets from a user or a hashtag on your OpenCUNY site. At OpenCUNY we recommend the Twitter widget available through the plugin Jetpack. This post will how show you how to set up the plugin through Jetpack. Occasionally Twitter reconfigures its end of the plugin and you may find that the plugin stops showing your tweets. You may have to adjust this in the future as Twitter may change its settings at some point. The first thing to do is activate Jetpack as one of your plugins. Once you activate Jetpack you’ll see a Jetpack tab in your sidebar. After having done this you’ll have to connect your Jetpack to wordpress.com. You’ll need to set up a wordpress.com account for this, so if you don’t have one already you should create one. This is because Jetpack allows you to pull features from wordpress.com into your OpenCUNY site. (We’ll be making a more detailed post on all of Jetpack’s functions in the near future). 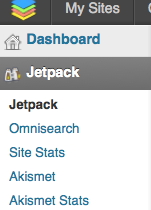 When you click on the Jetpack tab there will be a number of features you can activate within Jetpack. 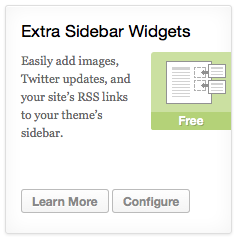 The one you need to activate for Twitter is the “Extra Sidebar Widgets”. Once you have that set up you can use the Twitter Timeline, which will now appear as an available widget under the Appearance tab. You can now add the Twitter Timeline to your sidebar by dragging it to the sidebar area in the right side of the screen. The last part of this process is to configure your sidebar settings, including getting your Widget ID. That you get by going into Twitter. On Twitter, if you go to the settings you will find a “Widgets” tab. It gives you the option “create new”. Search for either a hashtag or username. Having done this will produce a long number in the URL (the URL is the web address, for example this page’s URL is opencuny.info/…). You will also be able to find that number in the Widget Embed code that Twitter will generate for you. You do not need the whole code, just copy the digits of the widget ID. Now going back to your OpenCUNY site dashboard paste the digits as your widget ID in the widget settings for the Twitter Timeline. You can customize the other settings for the widget as you like. Once you hit save you should start seeing your tweets on your site!